March 21, 2008 — “Spectrum in Markers,” a collection of the works of award winning magic marker artist Michael Winston, will be on display at The Gallery of Laurel Lake, 200 Laurel Lake Drive in Hudson from April 1-30, 2008. Admission is free and open to the public daily from 9:00 a.m. to 9:00 p.m.
Winston is one of a select few artists who create complete art compositions using magic markers. He uses Prismacolor brand permanent artist markers to achieve his brilliant colors and three dimensional effects. 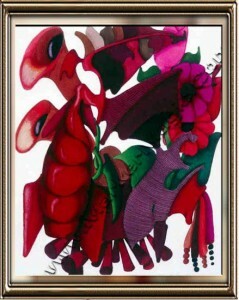 The artist’s unusual medium and style, which he calls “floral dreamscapes,” has caught the public imagination. His art has been displayed in art shows, gallery shows, hospitals and private businesses around Northeast Ohio. In 2003 his art was displayed on the program guides of the Beachwood Festival of Arts and the St. John’s Festival of Arts. His work has also been on the cover of Sunshine Artist Magazine, a national artist publication, and has been on Cleveland’s local television program, Fox 8 in the Morning. He has been an award winner in numerous Northeast Ohio art shows and competitions. Michael’s artistic style and medium have been discussed and reviewed in The Akron Beacon Journal, The Youngstown Vindicator and other local media. The artist has taught for 31 years at Warrensville Heights Middle School. He resides in Twinsburg, Ohio. The Gallery at Laurel Lake offers free exhibit space to professional and amateur local artists and photographers of all ages and backgrounds each month, as a public service to support the arts in Northeast Ohio. For information about future shows, or to inquire about available exhibit dates at The Gallery at Laurel Lake, contact Lisa White at 330-655-1492 or e-mail:Lisa_White@hmis.org. Laurel Lake Retirement Community offers a remarkable lifestyle for discerning adults who want to continue leading full, active lives filled with a variety of interests and aspirations, such as volunteering, working, traveling, wellness, cultural and lifelong learning pursuits. To learn more about this not-for-profit continuing care retirement community offering multiple home styles within 150 scenic acres in Hudson, Ohio, call 1-866-650-2100 or visit www.laurellake.org .